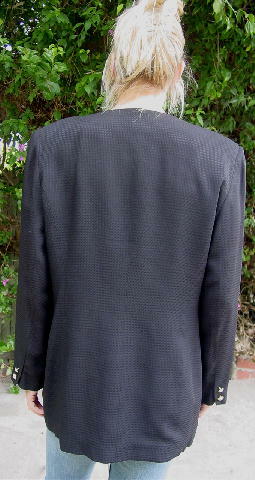 This 85% acetate and 15% nylon black long sleeve jacket is by Oleg Cassini. It has a full black synthetic lining. 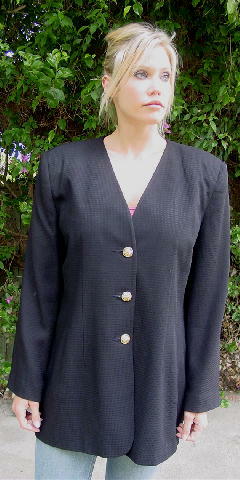 There are shoulder pads, a 10 1/2" deep V neckline, and it's collarless. 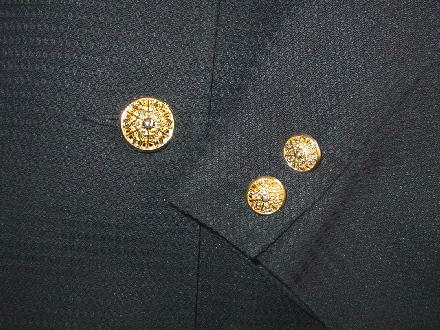 The sleeves have two gold-tone elevated design buttons on each, and there are 3 larger buttons down the front. It has a tone-on-tone design pattern and two lower vertical slit pockets. The front ends are 2 3/8" longer than the back. The tag says size 16, but it fits more like a size 12/14.